Often referred to as “the Beatles of Indonesia”, Koes Plus are the most beloved pop group in the history of Indonesian music, yet they’ve been basically unknown to the rest of the world. Born in 1969 from the previously established roots of Koes Bersaudara, the group blazed a trail across the Indonesian popular music landscape of the 1970s, with a scope that reached from the archipelago out to Singapore and Malaysia. The band began as a psychedelic era beat group and eventually streamlined their sound into a successful formula of hit making success. Recording relentlessly during the 1970s (40 full-length albums plus countless compilations) the band delivered a solid and familiar pop style and simultaneously branched out with an astonishing onslaught of LPs catering to specific genres which set a precedent for other popular groups to follow in the ensuing years. More than three decades removed from the peak of their popularity in the late 70s, most major Indonesian cities have their own Koes Plus fan clubs, local weekly radio shows dedicated to their music, and frequent tribute band shows. There are currently more than 60 Koes Plus tribute bands on the island of Java alone ranging in age from kids under 10 to those in their 60s. Koes Plus has become a national symbol of pride, an Indonesian legend larger than life; their music seamlessly crossing over from generation to generation. Reissued here for the first time, this CD contains the first two incredibly rare Koes Plus albums in their entirety: Dheg Dheg Plas (commonly referred to as Volume 1) from 1969 and Volume 2 from 1970. 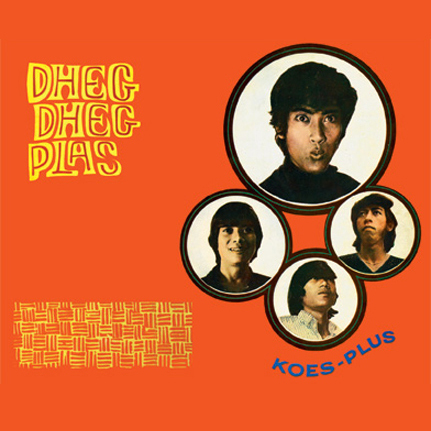 Dheg Dheg Plas features spectacular beat rockers such as Kelelewar (The Bat), Awan Hitam (The Black Cloud), Hilang Tak Berkesan (Gone Without an Impression) and the title track. It also includes the original versions of two of Koes Plus’ most brilliant and beloved ballads: Manis Dan Sayang (Sweet and Dear) and Tjintamu Telah Berlalu (Your Love Has Passed). Volume 2 has spectacular late 60s moments: brilliant and highly resourceful use of electric organ, amazing vocals and the acoustic guitar as a primary rhythmic component in an otherwise electric psychedelic and pop environment. It also includes their heaviest freak-out track, Pentjuri Hati (Heart Stealer). Both records have been coveted by serious “in the know” collectors worldwide for decades and will surely appeal to all fans of the beat and psychedelic era of the late 1960s as a significant missing piece of the global pop music history puzzle. Tri-fold Digipack CD with 20 page booklet featuring rare & unseen photos provided by Koes Plus for this specific reissue project and extensive liner notes of the band’s amazing history by Alan Bishop.